Double Jacket Mill Hose is an extra heavy grade discharge / fire style hose for higher pressure applications and those requiring improved abrasion resistance. 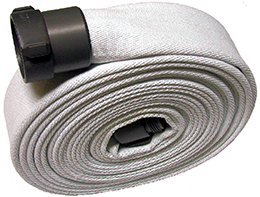 Mill discharge hose has a rubber tube with a woven textile jacket bonded to that tube. Double jacket type mill hose adds a second textile jacket for a longer lasting and higher pressure assembly. Use for heavy duty water pumping, fire hydrant supply, or flow testing applications. This hose rolls up flat for convenient storage and will not mildew. It can also be made with an abrasion resistant coating in a variety of colors for easy identification. Assembly styles include internally expanded fire style fittings (as shown) in brass or aluminum, or band clamped fittings such as cam and groove or pin-lug threaded hose couplings. MXF Assembly is aluminum with brass swivel standard. Steel shank with brass or iron swivel available.